Tokyo stocks ended higher on Wednesday with investor sentiment boosted by robust corporate earnings that triggered a rally on Wall Street and lifted shares in Asia. 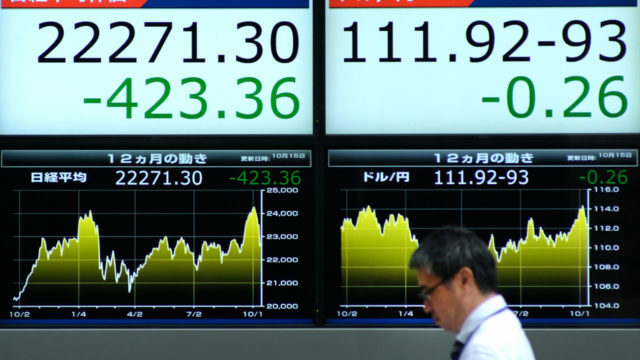 The benchmark Nikkei 225 index rose 1.29 percent or 291.88 points to 22,841.12 while the broader Topix index added 1.54 percent or 25.96 points at 1,713.87. Market sentiment brightened across Asia, after US and European shares extended gains on a wide range of factors including solid US business earnings, an apparent fading of tensions between Italy and the EU over Rome’s spending, and hopes that Brexit talks may see some progress. Tokyo players also embraced the dollar’s renewed strength. The US unit kept its ground at 112.25 yen in Tokyo after reaching 112.26 in New York, higher than 111.95 yen seen at the start of the week. “Investors cheered gains of US shares on the back of robust corporate earnings, as well as the relative stability of US bond yields,” Okasan Online Securities said in a note. “The Nikkei index began the day with buy orders leading the way. The dollar hovered just above the 112-yen mark. The yen’s downswing also brightened the sentiment,” the brokerage said. Strong gains of US tech issues drove up Tokyo-based IT shares. IT investor SoftBank Group added 2.13 percent to 9,790 yen, partly on news that Uber was aiming at a valuation above $100 billion for its share offering. Softbank has a 15-percent stake in the ridesharing service. Softbank stock had taken a hammering in recent days due to the firm’s links to Saudi Arabia, which is under intense international scrutiny after a journalist disappeared from its consulate in Istanbul. Sony jumped 2.23 percent to 6,498 yen. Panasonic rose 1.26 percent to 1,250.5 yen. Toyota gained 1.38 percent at 6,612 yen while Sumitomo Mitsui Financial Group added 1.84 percent to 4,481 yen. FujiFilm, which rose 1.66 percent to 4,890 yen, announced that a US court lifted an injunction that had stopped the firm’s merger talks with US printer maker Xerox. The Japanese firm plans to continue the discussion.